(CN) - In an ongoing challenge to the destruction brought upon several storied newspapers through Sam Zell's leveraged buyout of the Tribune Company, a federal judge is set to rule on a bank's motion seeking to limit its share of responsibility for the deal that bankrupted the company and led to a sharp decline in the quantity and quality of journalism produced by its papers, including the Los Angeles Times and Chicago Tribune. Several celebrated journalists formerly with the Los Angeles Times, including Pulitzer Prize winner Dan Neil, filed suit against the Tribune Company and GreatBanc in September 2008. The case was transferred from Los Angeles to Chicago where Judge Rebecca Pallmeyer is presiding over the litigation. Board members accused of accepting millions of dollars to facilitate a bankruptcy filing were dropped as defendants last month, and all claims against them have been folded into the bankruptcy proceedings. Zell's takeover deal involved borrowing billions of dollars against Tribune's assets and forcing its Employee Stock Ownership Plan to buy the Tribune through the purchase of $250 million in unregistered Tribune shares -- with the approval of the plan trustee GreatBanc -- at a highly inflated price, according to the complaint. Zell himself funded less than 4 percent of the purchase and avoided any risk and most corporate taxes due to a change in Tribune's tax structure. Although its employees now technically own the Tribune, they ended up with no voice in how the company is run. Their 401(k) contributions were replaced by contributions to the plan in the form of Tribune stock, which was worth little after Zell burdened the company with over $13 billion in debt, says the lawsuit, and became worthless when Tribune filed for Chapter 11 bankruptcy months later. 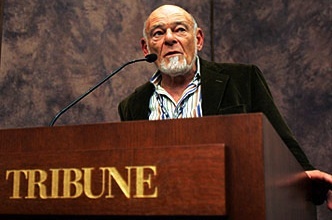 At the helm, Zell "pursued a strategy of slash and burn" that took a lasting toll on the Tribune's publications and reputation, according to the suit. In the wake of the buyout, Tribune laid off and forced the resignations of more than 1,300 employees, including many veteran editors and reporters, and used the plan to fund their severance and buyout packages. Zell installed rookie executives with no newspaper experience, left key posts vacant for months and blurred the distinction between journalism and advertising in some of the Tribune's most reputable newspapers by changing the order of command within certain sections, such as the Los Angeles Times Magazine. Judge Pallmeyer ruled in August 2010 that the journalist and other employees may, at most, be awarded non-monetary, injunctive relief against Zell, which may preclude him and his takeover vehicle, EGI-TRB, from further involvement with the plan. This will become a moot point if the plan is ditched as part of Tribune's bankruptcy reorganization, which is likely. The plaintiffs' attorney Daniel Feinberg points out, however, that "when the bankruptcy reorganization plan is finalized ... is anybody's guess." In the ongoing federal case, Neil v. Zell, the plaintiffs won summary judgment against GreatBanc late last year when Pallmeyer agreed that defendant GreatBanc had violated its fiduciary duty under the Employee Retirement Income Security Act by buying unregistered stock on behalf of the plan rather than the best available stock at the time -- registered Tribune shares. GreatBanc has filed a motion that is now pending arguing that recoverable damages in the suit cannot exceed the difference between what the plan paid for the Tribune stock and the fair market value of that stock on the date it was purchased. The plan did not pay $250 million for the nine million unregistered shares, according to the defendant, but only paid for them as the plan made payments on the $250 million loan it received in exchange for those shares. As a result, the plaintiffs' claim is worth no more than $15.3 million, and then only if the court allowed recovery of $12.5 million in interest paid on the loan, GreatBanc says. Plaintiffs rejected that theory and insist that several courts have, as well. They say the plan "bought all $250 million worth of shares ... regardless of its method of payment, and now owns all of Tribune's stock." That unregistered stock "was not worth $250 million then, and is worthless now," say the plaintiffs. Accordingly, plaintiffs state that damages can be calculated either by comparing the purchase price of the stock to its actual value at that time, by comparing the current value of the stock with the value that a "prudent investment" would have achieved since the transaction, or by comparing the price paid by the plan with the value of those nine million shares today. "It's like a complicated Russian novel - it's really hard to follow sometimes and you need to be prepared for a long read," said Feinberg. If GreatBanc's motion for summary judgment as to damages is denied, discovery will continue for several months to determine the suitable approach to measuring damages from the $250 million transaction but plaintiffs are confident that none of the methods will yield the figure sought by the bank. "It's agreed the stock is worth zero now," Feinberg said. "This is math my 5-year-old could do: 250 minus zero."